While admiring Osvaldo Quintero's huge photo gallery, I found the attached photo. 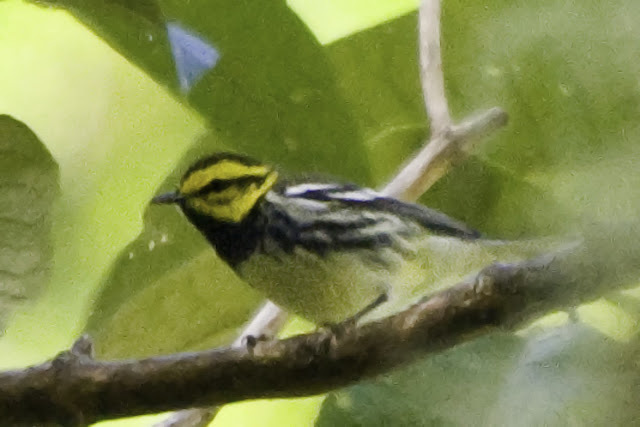 It was labeled as a Black-throated Green Warbler, but I think it is an adult male Golden-cheeked Warbler! Despite that I cannot tell if the underparts are completely white due to the quality of the photo, I think the black line through the eye is very distinct, and quite different from the olive auricular patch of the Black-throated Green Warbler. He took the photo in Volcan (no more details), march 15th, 2008. What do you think? The third report of Golden-cheeked Warbler for Panama, and the first with a photographic evidence? I think it is definitely a male Golden-cheeked. In addition to the black eye line, which slants upward at the end to join the nape, the crown is black instead of olive as it would be in Black-throated Green. I think the yellowish tone is due to the sunlight filtering through the leaves. Congratulations to Osvaldo, as well as to you for recognizing it. Yes, this is the third record, and first photograph. Rafel Luck, who was with Osvaldo on that fateful day, adds that the bird was seen at the beginning of Respingo trail above Cerro Punta.